Before I say anything specific about “The Phantom Menace,” I have to admit now that I’m not looking forward to “Attack of the Clones” and can fully understand why George Lucas lost the rights to “Star Wars.” I wanted to like this film, it’s “Star Wars” after all and a part of my childhood, but nothing can save this mess of a film and script. No amount of nostalgia can change the bad ideas that lead to the creation of certain characters and how they were portrayed and this film is easily a net negative versus net positive neutral in overall quality. The film was directed and written by George Lucas and produced by Rick McCallum. 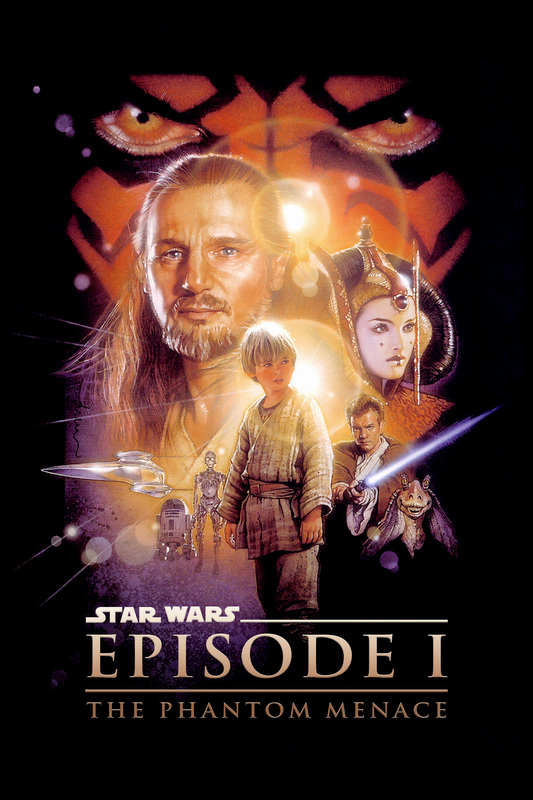 The story involves the Trade Federation blockading Naboo to force a treaty that favors their monopoly leading to Chancellor Valorum sending the Jedi Qui-Gon Jinn (Liam Neeson) and Obi-Wan Kenobi (Ewan McGregor) to resolve the dispute. Manipulations of the Sith soon complicate things leading to the Jedi on the run as they seek to protect the Queen (Natalie Portman) and save Naboo. The Pros: The Universe – The Old Republic is fascinating and there is so much we could have been shown instead of told. The Republic is corrupt and the Sith are clearing manipulating a lot behind the scenes but we don’t get any of that…we don’t even know how the Trade Federation really works and they are the main antagonists besides the Sith. Still, a lot of good ideas here just poorly executed. The Soundtrack – It’s John Williams, you can’t go wrong with the soundtrack and even with very crappy dialogue and characters we still have a soaring score that works really well, especially in the fight with Darth Maul. Qui-Gon Jinn – I actually liked this character. He is very much the maverick and a bit of a sociopath in how he manipulates others but it makes him compelling. I wish we had gotten more on why he clashed with the Council and the reason behind his focus on the prophecy. He is very much the chaotic monk and it makes him a lot of fun. Liam Neeson does a great job too. I actually cared that Darth Maul killed him and I wish he’d done something about the slave trade on Tatooine as the Council was clearly doing nothing. Darth Maul – Darth Maul is wonderful and really should have survived this film. He has the same threatening feel as Vader did being the Emperor’s dragon and keeping him around would have given the chance to grow his threat and establish him as the corrupting influence on Anakin and even Obi-Wan. He is the enforcer and a truly terrifying character with an awesome character design. I know he was brought back in the “The Clone Wars” but he deserved that same chance in the films as the mystery of his character gives so much to explore. Palpatine/Darth Sidious – The guy is surrounded by idiots and manipulates them so well. From setting up Padme to call the vote of no confidence leading to him becoming Chancellor to never revealing his intentions and remaining cypher so he can use all the factions of the senate. Ian McDiarmid is fantastic and is one of the interesting characters in the films as it really is about his rise to Emperor. Obi-Wan Kenobi – Ewan McGregor was a great casting choice for young Obi-Wan and we see echoes of who he will become as he is cautious and tends to go with the Council versus Qui-Gon who could care less. In this we already see the Lawful Good Jedi Master he will become. He is also cold in his own way too as he talks about how Anakin should not receive training to Qui-Gon in front of Anakin…so he isn’t prefect and we see how his duty to the Council and Qui-Gon is why he decides to become Anakin’s master in the end. He also avenges his Master and is the one to defeat Darth Maul. Okay: Tatooine – The Pod Race is cool but useless in the end as they could have found another way since all they had to do was get in contact with the Capitol, though we do get some good exploration of Padme, Obi-Wan and Qui-Gon at least. Padme – She’s a cipher and she doesn’t approve of a lot. In the end she makes peace with the Gungans and is shown to have humility (learned from the Jedi?) but that is about it. She’s okay as a character but not great. The Cons: The Jedi Council – These bland folks are not fleshed out at all and are oblivious to the corruption around them. It’s a sad state but we are never able to fully see just how corrupt and inept they are because they are heroes simply for being Jedi. I hated Windu and Yoda in this as they are just tools who fail to see past the Temple and never send any help out even when they know a Sith is probably going to be on Naboo. They are useless. The Senate – The Senate like the Jedi is useless as we see that everyone is either a tool (Valorum) or a manipulator to their own ends (Palpatine). Like the Jedi they are a useless organization and how they got that way is never explored at all. Naboo – Naboo is a blank slate as the Gungans are just aquatic rabbits and the people are people we never interact with or see. We hear about their suffering and dying but never witness any of it. We have to take everyone’s word on things when we have no reason too given the corruption established in the opening credits. Midi-Chlorians – The force is not physical, Yoda establishes this in “The Empire Strikes Back,” I remember that and I haven’t watched the film for years. The very existence of these things cheapens the force and turns Anakin into “The One” which misses the point of the force being something that binds “All” of us together and is always with us. If only special people have it, than it ceases to be what binds us together it becomes something no more than genetics. Anakin Skywalker – I’m sorry Jake Lloyd, but you can’t act. His lines all fit the “perfect child” syndrome that is a problem in a lot of movies and making him “The One” gives him plot armor enough to destroy a Droid Base in space when he’s never flown a ship before…and it all happens by accident! If he’d been a young adult at least there would be the excuse of him having experience from delivering stuff for Watto or the huts like Luke got experience playing with his friends. The Ending – Anakin destroys the reactor and there is peace on Naboo. The only interesting thing that kind of works is Obi-Wan adopting Anakin as his apprentice and the final fight with Maul. The Celebration at the end doesn’t mean anything because the people of Naboo are invisible to us. We never saw their struggles only heard about it. The planet was nothing more than statistics. The Writing – The writing was the biggest problem. From having Anakin be a child, to Jar Jar being core to the plot and from the motivations of the Trade Federation, Senate and Jedi being big giant question marks. No one’s motivations are clear except Obi-Wan and Palpatine which is sad given how large the cast is. There is so much that could have worked if this script had not been written George Lucas as his world is compelling, “The Clone Wars” and “Clone Wars” are living evidence of this…but not so for “The Phantom Menace.” When George Lucas wrote and directed this story he killed whatever promise there was with a lot of poor writing and directing decisions. Anakin should have been a teenager already or Luke’s age, Midi-Chlorians should have never been a thing and Jar Jar should not have been in this film and Obi-Wan should have been the character we were following with Qui-Gon along as a rogue Master. If these things were done this film would have actually been good, even with the stilted dialogue as the circumstances of these changes would have forced a greater exploration of the world like the corruption of the Senate and the ineptness of the Jedi Council. Instead we got very bad comedy and mostly uninteresting characters in a world that didn’t feel lived in. The CGI isn’t the problem I remember, the problem is the script and the character choices that were made. You take away those things and we would have had a good film where what happens in the film would have felt real, had stakes and in the end, meant something. I get why Disney owns “Star Wars” and George Lucas no longer does. The choices made in making this film are ample evidence that George Lucas clearly had no idea what he was doing. Final Score: 5 / 10. 50%, the reason it isn’t lower is because of Liam Neeson, Ewan McGregor, Ian McDiarmond and the fact that Darth Maul was used very well as a Dragon.